A common and often abundant species occurring throughout England and Wales, the NBN map gives the impression that it might be more common in the west as there are many records from the welsh coast, including Anglesey. In Scotland there are records from the southwest including the southern islands (Morris); the NBN gives a record from northwest Islay, otherwise restricted by the occurence of the host plant. Common throughout our Watford area wherever its host, Purple loosestrife (Lythrum salicaria), occurs. 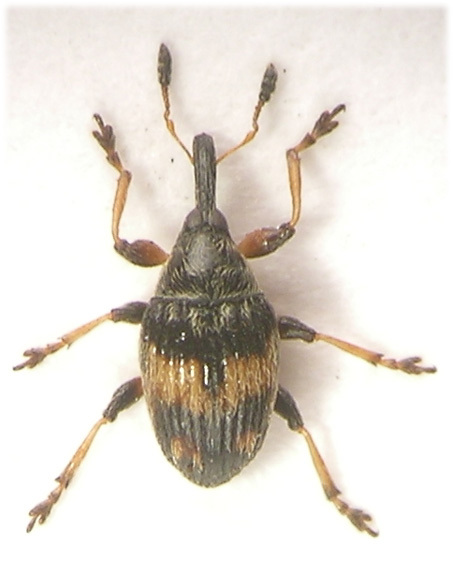 We have recorded these weevils from the vicinity of all local rivers and parks; below Cassiobury park, where the host is abundant, we have recorded them as common each year from 2005-2009. Adults may be found in small numbers before the host flower buds open, generally during May, but soon after flowering they become very common and remain so at least into August. Shaking the flowering stems over a sweepnet or into a polythene bag will usually reveal the adults in numbers. Larvae develop within the ovaries (Morris, ibid). 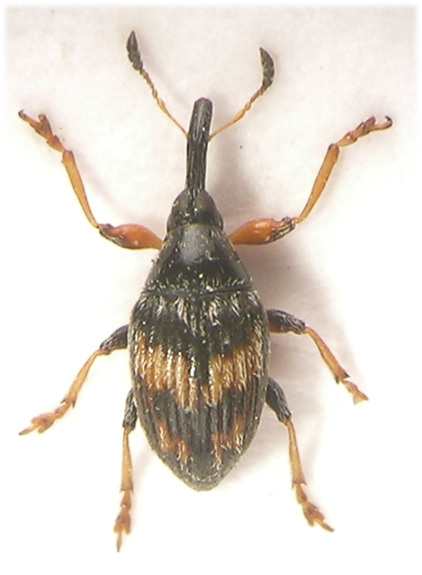 With a little experience these very distinctive weevils will be recognised immediately in the field. 1-2mm. 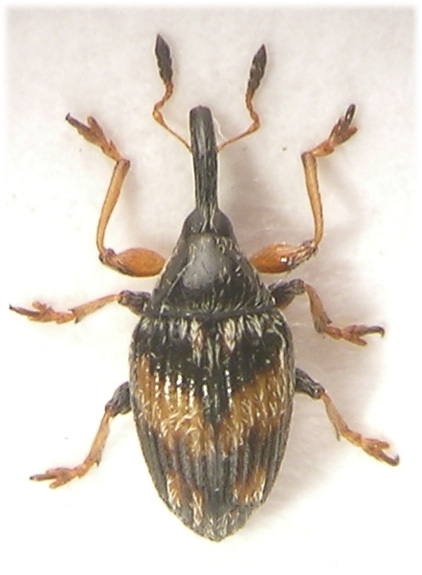 Upper surface entirely black but for yellow or cream makings to the elytra; often, but not always, a short longitudinal streak either side of the scutellum, a broad oblique transverse band at middle and another subapically. These markings vary in intensity and size and same specimens may be almost entirely pale over the apical two thirds. Head very narrow between eyes, finely punctate and pubescent behind eyes. Rostrum longitudinally furrowed and rather strongly punctured, longer in the female; about as long as the head and pronotum combined. 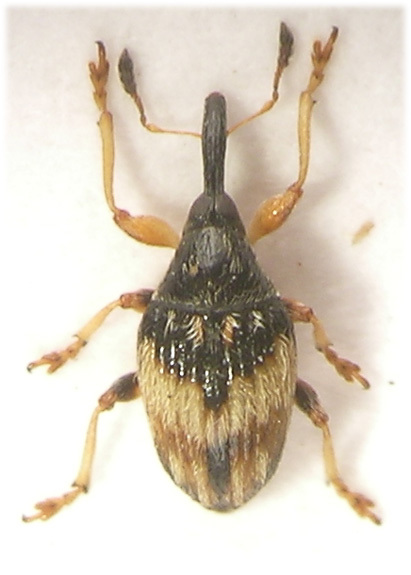 Antennae yellow with club black, inserted about halfway along rostrum. Club elongate and pointed, rather loose with all segments obvious. Pronotum strongly narrowed, front margin about half the width of the hind margin, finely and sparsely punctate and with scattered narrow, pale scales. Without side margins. Scutellum very small, hardly visible. Elytral striae broad and well impressed to apex, interstices convex. Legs yellow, meso and metafemora darkened to some extent, often extensively so, profemora less darkened, often not at all. All tibiae with a small apical tooth in male. Second and third tarsal segment strongly bilobed, last segment elongate, Claws connate.